Around here we do crafts just about every day, my daughter learns best by being in an environment where she can use her creativity. And as you can imagine, it can get pretty pricey, especially when I need items for a craft project that we might not have on hand. Having everything on hand is a huge plus. Yesterday the kids begged to paint, so I was able to indulge them. Since I had bought the bottles of paint on sale for 50% off at a local craft store last year, I didn’t worry about how much we used. I let them go for it, we did hand painting (very messy!) and painted with paint brushes. The end result was two very happy kids who got to use their energy and talents to create beautiful pictures for daddy when he got home. Plus, some priceless moments watching my three year old intently working on his projects! One of the ways we save on craft supplies is using the same concept I use with my grocery shopping.We purchase craft supplies when they are on sale and we have a coupon. Many craft supply stores won’t allow a coupon with a sale item, so if we find one that will allow it, that is a great stock up opportunity. One of the biggest tricks I do to keep craft costs low is to use the 40% off coupons that come in the Sunday paper from stores like Hobby Lobby Michael’s or Joann’s. They are typically only good for full priced items, but if we want things like jugs of craft paint or Popsicle sticks, I purchase one separately each week. Competitor Coupons: To cut down running around, our local Joann’s takes competitor coupons, so that is usually where we shop. Find out what your stores policy is on competitors. Want List – I keep a list of the things we want to purchase the next time a coupon comes up for 40% off. Clip Coupons Weekly – Each week whether we need anything or not, I go ahead and clip that weeks store’s coupons and keep them in my wallet, just in case we make and unplanned trip. Teacher’s 10% Discount – If you are a teacher or home educator you can sign up to get a card for an extra 10% off any purchase. Hobby Lobby – Sign up for their emails to receive a weekly 40% off printable coupon and the online ad. Michael’s – Checkout their online ad, which has clickable links to print a 40% off any regular priced item coupon. Joann’s – Accepts competitor coupons, but not typical to find online printable coupons, only in weekly store flyer. A few weeks ago I let you into Organizing my Homeschool Area Part 1 and Part 2 project to see how we were organizing and storing our craft supplies. Here is how I keep our craft projects organized and easy to pull together or put away. Plastic Bins with Lids – I keep all the paint brushes, water colors, small paint strings, newspaper (for covering the table) and smocks in a bin. When it is time to create, we just pull the whole box out and use what we need. I use the plastic bins with lids, and get them for around a $1 at Target or Walmart. Tiered Shelf Organizers– Since the paint bottles are too big to put into a bin and if spilled would make a mess, I have them on one of the tiered shelf organizers for easy access. How do you save on craft supplies? Share with us any tips and tricks you have found to make crafting less expensive. JoAnn also has an iPhone app, in case anyone else out there is an iPhone owner. It’s a free app that includes a coupon “wallet” in which you can save coupons. I’ve found that it typically includes the same 40% off coupons you get in the flyer… so it’s a way to get an extra coupon. And if they have special coupons (like a 10% off your purchase, for example) in the flyer, it is usually in the app, too. But do note that you can only use each app coupon once (they each have a unique number like the scannable ones, apparently). 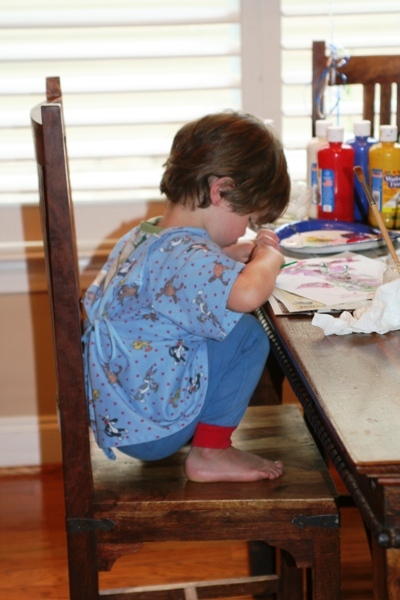 Here are two other tips that work well when you have crafty kids. Get a large box start collecting every little thing that looks like it might be something. Take for example tonight I am making tacos. The sleeve inside the box to hold the tacos is a ridge white cardboard piece. I would save that. Have an old piece of clothing or other piece of cloth that just looked odd I would save that too. I saved everything for years so much so I almost can’t stop now. This box was pulled out every time the kids got board they got really great at making home made greeting cards so much so that they had friends pay them for the cards they made. Save small old birthday candles and buttons even for this type of crafting. You might have to buy a few pieces of card stock paper and some blank envelopes card size. This is what my grad students do when they come on break to release stress they pull out the box sit and watch a movie and make cards! Often later in the year I will get a card I watched them make. Hobby Lobby also has a mobile coupon. If you pull up their website (mobile[dot]hobbylobby[dot]com) on your phone you can click on View Weekly Coupon. Then the coupon comes up on your screen and you just show that to the person at the register when you check out. The great thing is that you can use it each time you go since you can’t give it to them to keep like a paper coupon! I use shaving cream to paint with. 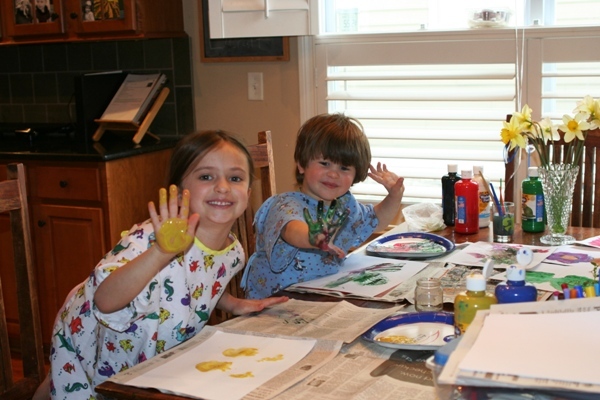 Add a little dab of color and it makes great finger paint,washes off great. Chocolate pudding also makes good finger paint and its eatible Eatible play dough equal parts of honey,peanut.butter,and powdered milk. My grandchildren do not like to use the back of used paper,so we use a lot of paper. My nine yr old makes intricate paper airplanes. Joann’s has a card you can use anytime, and I think Michaels is only on Friday’s. Not sure about Hobby Lobby. I was wondering what homeschool curriculum you use. Looking for next year and try and to gain as much wisdom as I can. Thanks so much! Crissy, we use My Father’s World Kindergarten and love it! Lots of online resources on their Forum. Besides hitting those stores (J, M, & HL) with my 40-50% off coupons, I have snagged craft supplies at estate sales for pennies on the dollar! Just went to one last week and ended up with hundreds of $$$ worth of scrapbooking and sewing supplies for little to nothing! I also try to find office supplies at estate sales as well. Makes the hunt much more rewarding!